We woke at 8.00 a.m. and enjoyed our final breakfast in the Sofitel where guests are really spoilt for choice as there are so many dishes to choose from. I started the day with a freshly made honey and oat smoothie which was delicious, then had some fruit and yoghurt before paying my last visit to the egg station for one of their delicious omelettes which were always cooked to perfection with a moist, fluffy texture. Although it’s a very large hotel and seemed to be full all weekend, there was never a queue and staff were all polite and friendly. Each morning I had been eyeing up the bread and butter pudding, a dessert of which I am very fond, especially on a cold winter’s day. I would never have thought of eating it at breakfast though but temptation got the better of me and I succumbed to a bowl. It tasted sublime, warm, comforting nursery food at its best, even if it was only 9.30 a.m. in the morning. 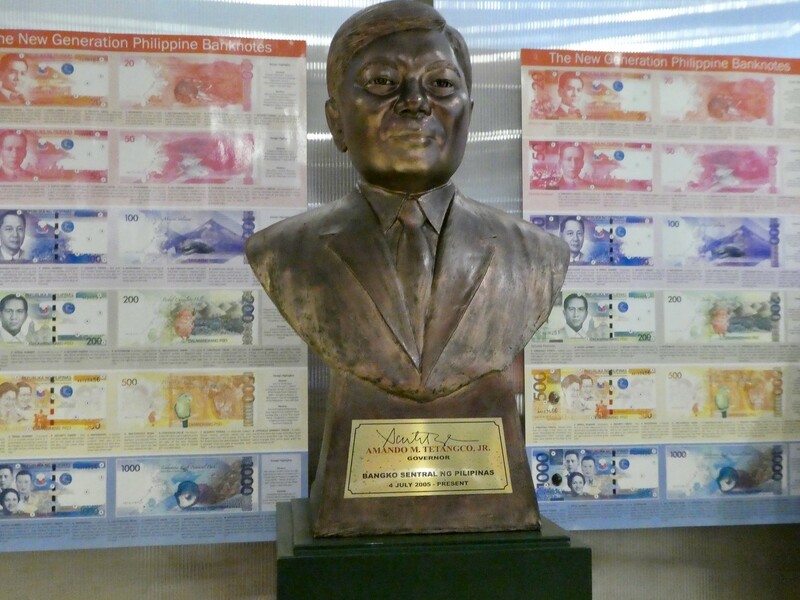 As we had arranged a late check out we were able to walk off our late breakfast with 30 minutes of brisk exercise to the Bank of the Philippines Money Museum. Getting there from the Sofitel was relatively easy except for one very busy four lane road that we had to cross which didn’t have a pedestrian crossing but was manageable with care. 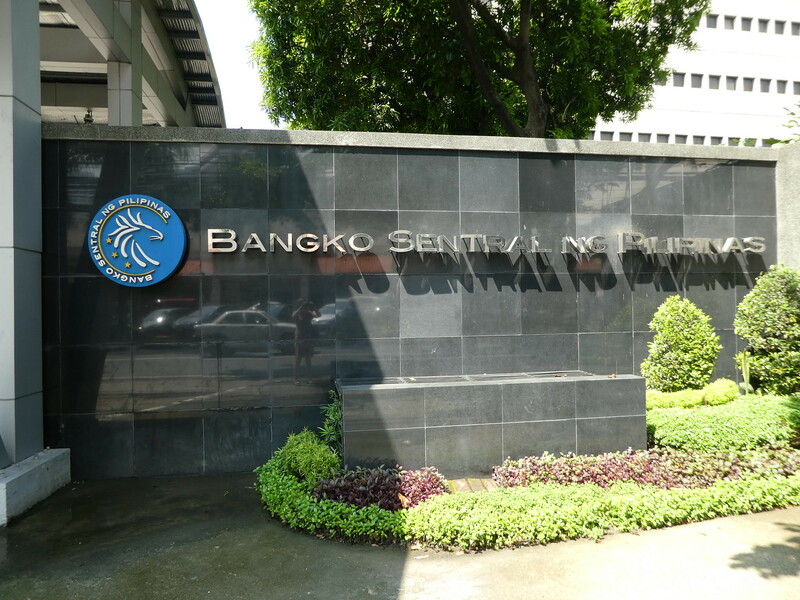 The bank complex is enormous with the museum entrance being around the back. Admission is free but visitors must bring passports or another form of I.D. and complete a short registration form. After handing our passports over we were supplied with security passes to access the museum, the clerk vaguely telling us to go outside and turn left. Surprisingly, the Money Museum is not very well signposted from inside its grounds and we ended up going into the wrong building needing to be re-directed. Eventually locating the actual museum, we then needed to enter our names and addresses into a visitor’s book before being allowed inside. It appeared that we were the only visitors that morning apart from a group of 15 school children who were sitting on the floor of the entrance hall watching a video on the processes involved in making money which we also found interesting. 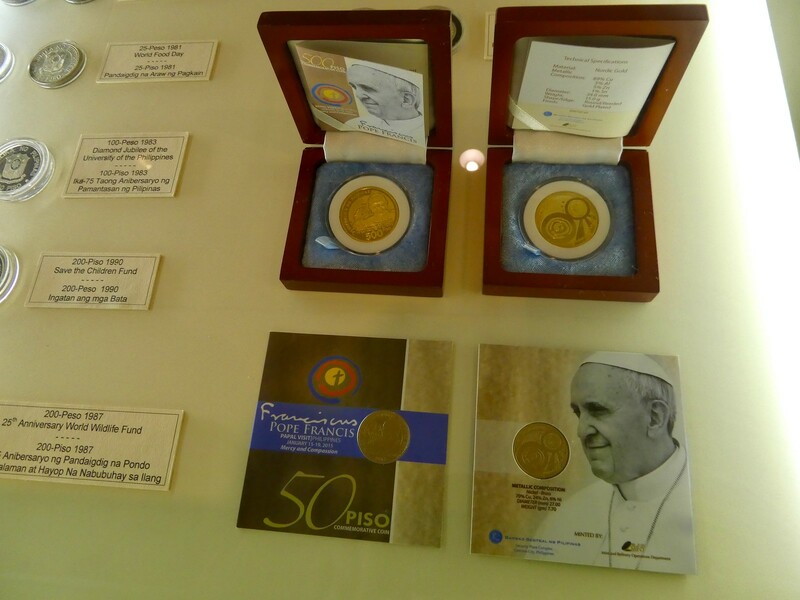 The museum charts the history of Filipino money and also includes a collection of bank notes from around the world. It’s not a huge museum but one that’s interesting. Returning to the hotel we had to take our life in our hands crossing the motorway type road once again, but thankfully we made it across safely. Back at the hotel it had been our intention to have one last swim but it would have been a bit of a rush as we needed to check out by 1.00 p.m. Instead, we drank cups of green tea in our room and gathered the last of our bits and pieces together. 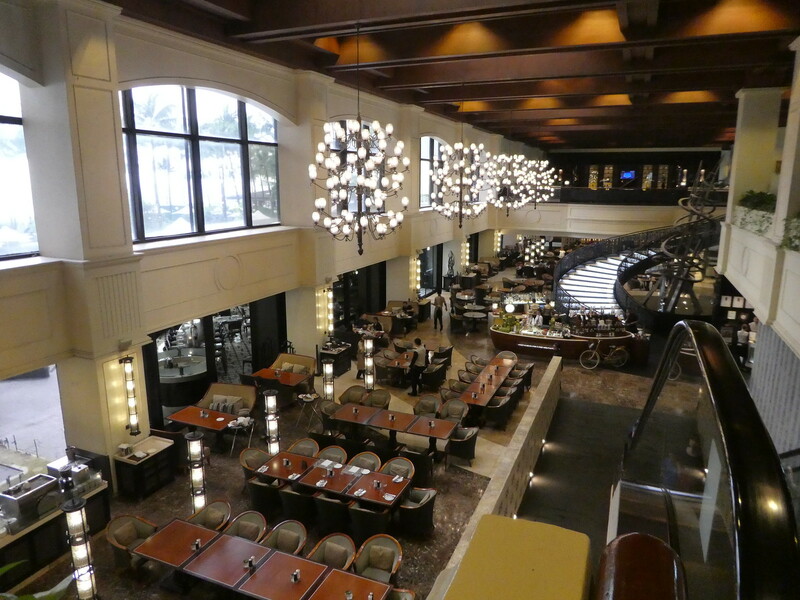 The Sofitel Philippine Plaza had been an excellent choice, with luxurious accommodation and impeccable service as one would expect from a five star hotel. Our only quibble was that none of the rooms came equipped with balcony furniture. It seemed ridiculous having a spacious balcony with stunning views and not being able to sit outside to enjoy it. I can only assume that due to the likelihood of strong winds the hotel don’t want patio furniture blowing off balconies, causing damage and hurting people. After checking out of our room we used our Grab app for the final time this holiday to order a taxi to the airport. As both our suitcases were large, we noted this in the additional information box when requesting a driver. We managed to secure a taxi within five minutes but when it arrived it had the smallest boot imaginable! Thankfully the hotel porter managed to squeeze one of our cases into the boot and negotiated with the driver to prop the other one up on the front passenger seat. This worked well and as there were no traffic hold-ups the journey only took 20 minutes. The taxi fare was 145 Peso plus a 45 Peso airport surcharge (£2.80 in total) for dropping passengers off at the terminal. All bags need to be scanned before entering the departure hall and tickets inspected but as we had checked in on-line and not printed out boarding passes the security officer just waved us through. 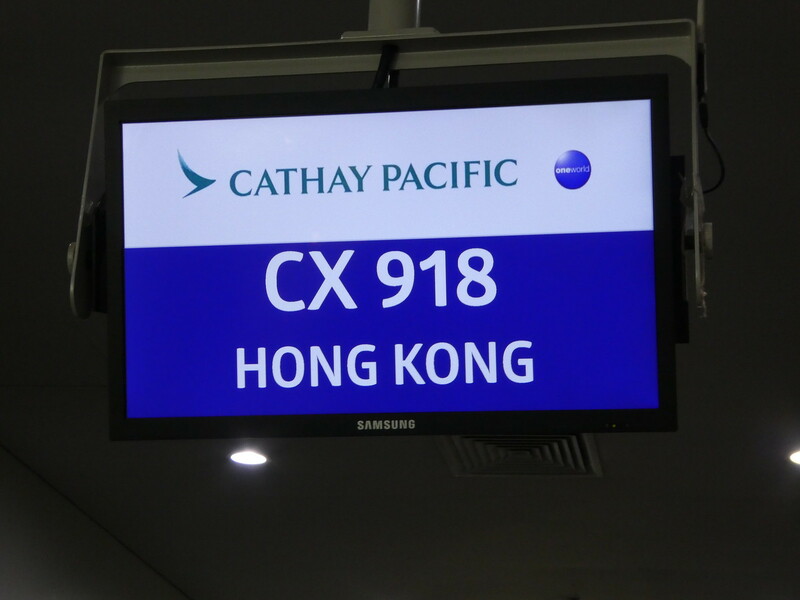 Staff at the Cathay Pacific desk in Terminal 3 were very efficient and we were soon passing through security and immigration. The ‘foreign passport’ queue was actually the shortest and formalities only took a few minutes allowing us ample time to explore the airside facilities. After much deliberation, we settled on the Great Man Han restaurant ordering dishes of Chicken Adobo and Roast Beef with cups of tea. The food was quite tasty and the bill only came to 445 Peso (£6.26 in total) which was only slightly more than we had paid for two hot drinks in Manchester Airport at the start of our trip. Our flight departed 40 minutes late due to delays at Hong Kong airport but boarding was efficient and we were soon underway. Our Cathay Pacific A330-300 airliner had numerous empty seats which was quite a contrast to the fully booked flight we arrived on. 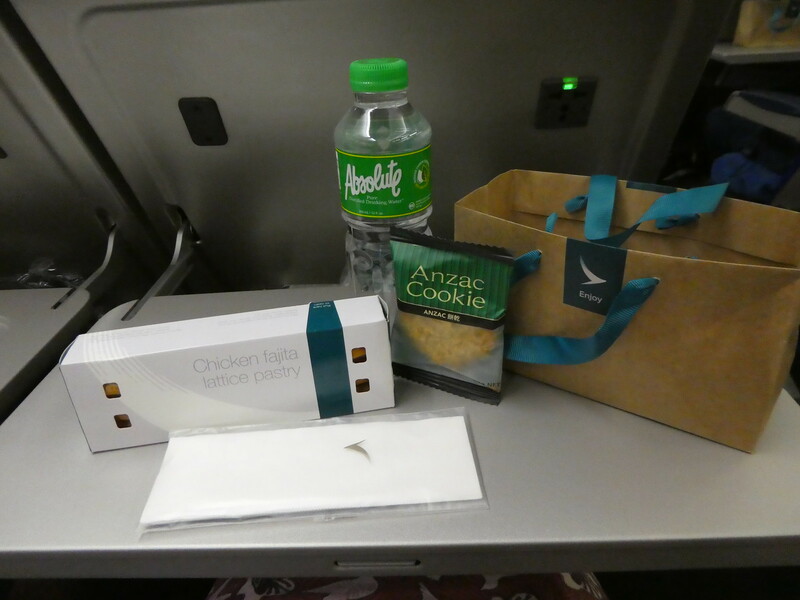 Our selected seats were near the front of the economy section in seats 50A and C and soon after take off we were served a chicken fajita lattice pasty, Anzac coconut biscuit and a bottle of water. The 1 hour 40 minute flight sped by and feeling quite sleepy I didn’t make use of the in-flight entertainment instead having a rest before touching down into Hong Kong at 7.30 p.m. The foreign passport immigration queue appeared to be very long but as numerous desks were open it actually only took a few minutes and we were soon retrieving our suitcases from the carousel in the baggage hall. From there we made our way to the airport bus station to take the A11 City Flyer over to North Point. Tickets cost HK$40 (£3.90) and need to be purchased from the kiosk before boarding ,which is located on the left as you enter the bus station. Buses run every 15-20 minutes and our bus was just about to depart as we clambered on board. The city flyers have ample luggage storage space and fortunately we managed to get the two remaining seats on the lower deck. 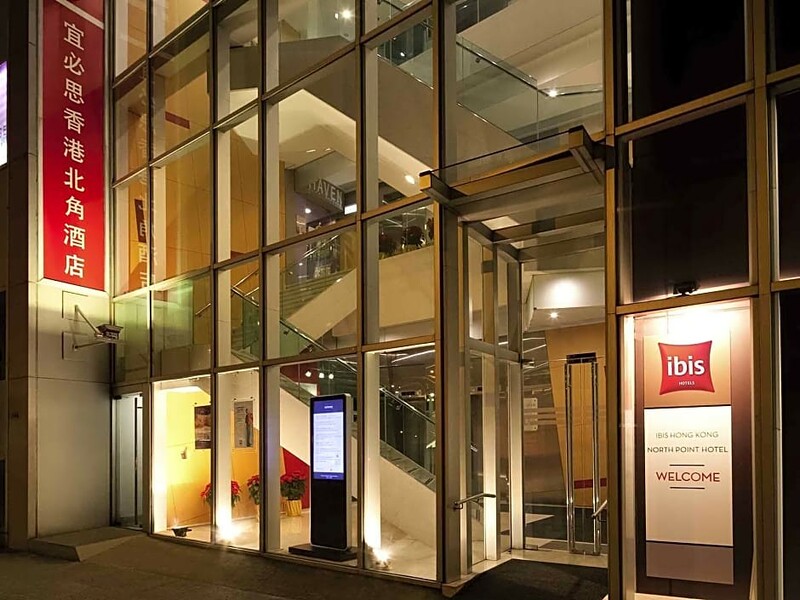 The journey took approximately one hour and terminated at North Point bus station which was just a couple of minutes walk from the Ibis North Point Hotel where we had arranged to stay for the next five nights. 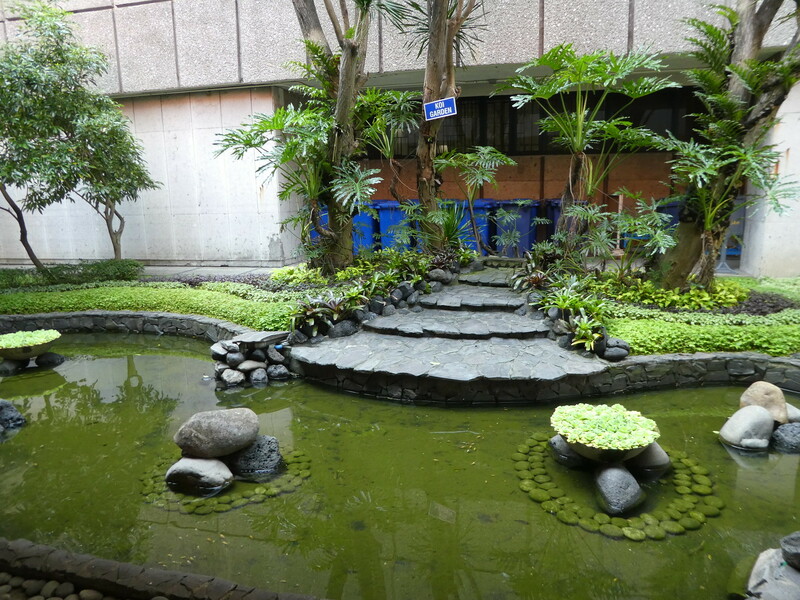 We have stayed at this hotel several tines as it is just a few steps from the nearest metro station on the Island Line. Our room on the 30th floor still had harbour views but views from lower floors are now obscured by building works across the road. We quickly unpacked and then wandered along the familiar Kings Road for a late evening snack and to buy some milk for our bedtime drinks then it was off to bed looking forward to our next few days in beautiful Hong Kong. Thank you for taking an interest in my blog and for the nomination, its great to get the recognition and I’ll certainly take a look at your link. Such a lovely inspiring travel blog post. Keep sharing more. I hope you too subscribe my blog back. thanks. Thank you for taking the time to comment on this post, it’s much appreciated and I’m pleased to read you enjoyed it. How exciting back in HK for you. Look forward to reading about what you do in HK Marion. Thanks Sue, I always love a visit to Hong Kong! 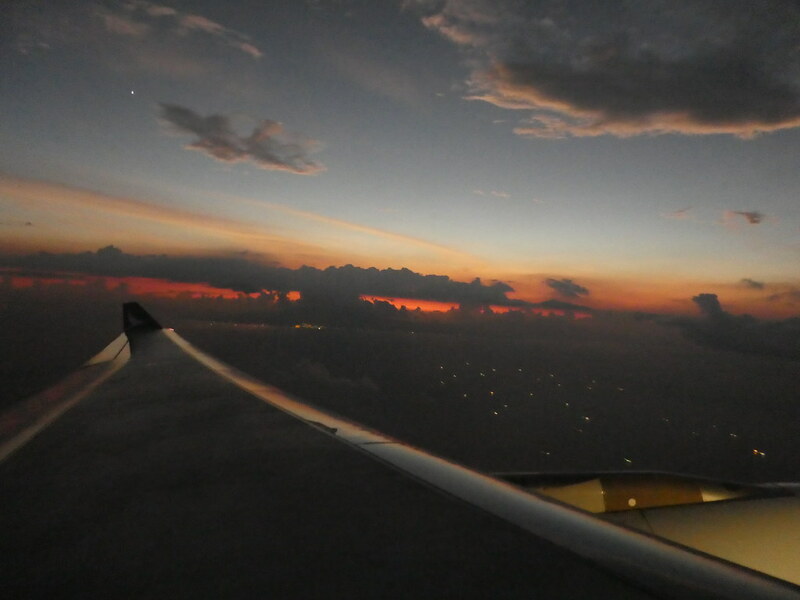 Loved your posts on Manila and looking forward to the posts on Hong Kong . 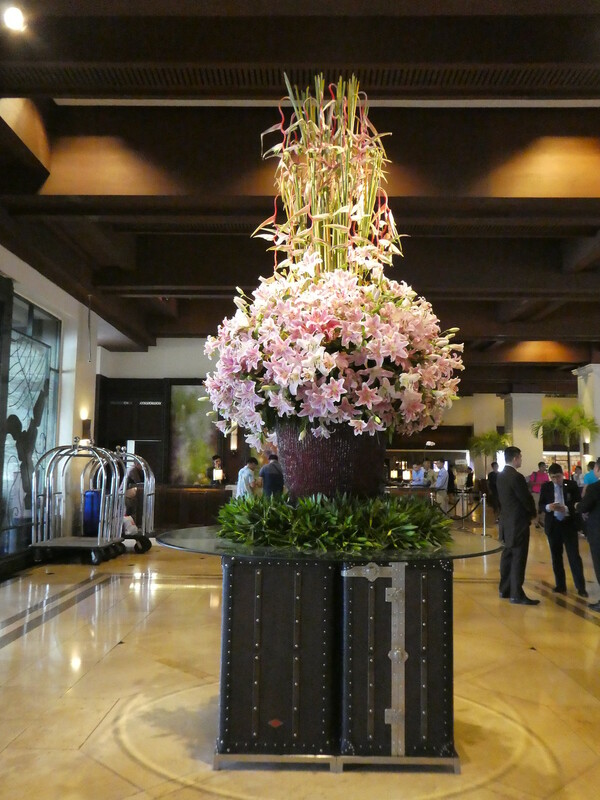 The Money museum in Manila looked very interesting and the Sofitel Manila looks like a very elegant hotel. Didn’t realize Hong Kong and Manila were so close to each other. Thank you for your continued interest in this series of posts. The Money Museum was very interesting and definitely worth a visit. Hope you enjoy the Hong King posts too. Have a good weekend! I haven’t been either to the Philippines or Hong Kong, so looking forward to your reports. Thank you for taking an interest in these posts. Hope you enjoy my series on Hong King too. Thanks Jason for your continued support. Hope you have a good weekend! You’re welcome! Have a great weekend too! My first trip to HongKong was in 1970. It was a very different place in those days and cheap to stay and travel. I watched it develop and it particularly took a spurt in modernization after it was ceded back to China as a special economic zone. It is no longer cheap and very upmarket. In my day of business travelling it was the place to go for off shore corporation management and first class legals, particularly as an entry point into the China market. It didn’t take long for Mainland China to replace the West as the major investment holder in HK business and property. On my first visit it was still under British rule, that would be in the mid 90’s and we flew into the old airport. This is now my 6th visit and although I’ve witnessed changes, I still love visiting Hing Kong.